Join us along with other local Ivy alumni on this special Echo Mountain hike in Altadena. Cost: No charge, but please RSVP below so we know to expect you. 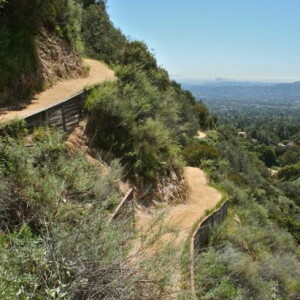 Echo Mountain is one of the few moderate-difficulty hikes in L.A. that delivers the same sort of spectacular views found on hikes with super-challenging difficulty levels. On a clear day, you can see all the way to Mt. San Jacinto in San Bernadino to the east, and all the way to Catalina Island to the southwest! DIFFICULTY: 6 miles round-trip. 1400 feet of elevation gain. Moderate for experienced hikers; challenging for beginning hikers. KIDS: As always, kids of all ages are welcome if they are up for the physical challenge described above, or you are ready/willing/able to carry them. TIME TO FIND PARKING: Budget about 15 minutes. There is ample unrestricted street-parking available near the trailhead, however this is a popular hike on the weekends. CAR-POOLING: If you are interested in potentially car-pooling with others to this event, please let us know. RSVP REQUIRED: Please RSVP below by October 26th so we know to expect you.